Before planning your next vacation or your next trip to the hospital, old-age home or medical clinic you’ll want to read this! We’re all familiar with the stomach flu (known medically as gastroenteritis) and it’s nasty symptoms (the most common being excruciating stomach cramps, diarrhea and vomiting). 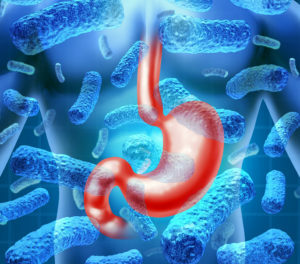 What you may not know however, is that gastroenteritis deaths have become quite common and in the United States their are 15,000 deaths per year caused by the C. Diff bacterium alone. How did I do? Read on to find out. At the end of September, 2015 the Star Princess cruise ship experienced a nasty outbreak of the norovirus — with 61 passengers falling ill while at sea.1 The norovirus is the most common cause of the stomach flu in humans; it’s highly contagious and it can be transmitted through contaminated food and water. Since sanitization levels aren’t always as high while traveling abroad, your risk of contracting the virus while traveling is often increased. Norovirus also spreads through contact with other infected individuals and it spreads extra quickly whenever there are many people in small areas, which is is why it is so common at hotels, dorms, restaurants and on cruise ships! Clostridium difficile, or C. Diff, is a bacterium that causes inflammation of the colon, and it’s the most common infection in North American hospitals. The bacteria are found in feces, but they can be transferred to surfaces where they can live for long periods of time. You can contract C. Diff by touching an infected surface area and then touching your mouth or any mucous membrane; and healthcare workers can unknowingly spread the infection to you through hand contact. While scientists use to believe that the bacterium was contracted primarily in hospitals, they’ve now realized that it’s also being contracted at old age homes, dental offices and medical clinics. True or False: The Flu Shot Will Protect You From Gastroenteritis? We would never tell anyone not to get a vaccination; instead we advice that you ask questions, read the research and come to your own informed decision. Should you decide to forgo vaccinations there are natural way to support your immune system and to help reduce your risk for both influenza and gastroenteritis. Probiotics: A whopping 80% of your immune system is located in your gastrointestinal tract (GI) and most of us have GI systems that are deficient in the healthy bacteria that are crucial for optimal immunity. Integrating probiotic-rich foods into your daily diet is a great way to restore the healthy bacteria balance, and some rich sources include kefir, sauerkraut, tempeh, miso and spirulina (for more info: Top 5 Probiotic Rich Foods. Prebiotics: Prebiotics help probiotics to attach to your intestines and to flourish, and they should be taken along with probiotics. Some of the best prebiotic foods include dandelion greens, onions, garlic, leeks, asparagus and bananas. Antiviral Foods and Herbs: Certain foods and herbs have potent virus and bacteria fighting properties and consuming them regularly is an excellent way of turbo charging your immune system. For a list of our top recommendations: Flight Flu with Food & Herbs. Lifestyle Recommendation: Try to maintain a regular sleep schedule, to stay active, to eat a balanced, whole-foods based diet, and to actively reduce stress in your life (stress is a major immune system compromiser). Having a positive, optimistic outlook is also important for optimal health and immune system function. Finally, avoid immune system compromisers such as sugar, refined food, fried food, caffeine and alcohol. Whether you’re planning an oversees trip, you have a loved one in a hospital or elderly home, or you simply want to reduce your risk for contracting a deadly virus in the future, we’re here to help! Book a consult with our team of holistic experts, and we’ll not only help you create an internal environment that is turbo charged to ward of deadly viruses, we’ll also help you address other health concerns and teach you how to create the vibrant, healthy body you deserve! More Info.